More 'bling' than the most stylish character can carry off! Publisher's blurb: "Who needs one ring to rule them all when you've got 30 to chose from? "Why limit yourself to the 30 rings in your core rules, when you can double your options and pick from rings like the ring of retaliation or the ring of safeguards? "With #30 Rings of Defense, your characters can find the offense in their defense, the sacred and the deflection bonuses, the immediate response and the constant benefit. And with the supplemental mechanics we've developed, the ring your warrior found at third level will still be useful when you're picking out prestige classes! "Don't just settle for a simple ring of protection anymore, get a ring of aegis. 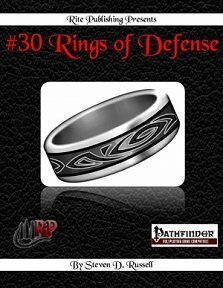 Pick up #30 Rings of Defense and trick out your character with the kind of rings King Solomon himself would have wanted."